Dept. of Civ. and Earth Resources Eng. The OCEAN SYSTEMS ENGINEERING focuses on the new research and development efforts to advance the understanding of sciences and technologies in ocean systems engineering. 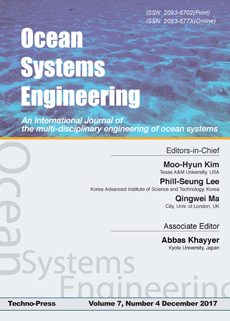 The main subject of the journal is the multi-disciplinary engineering of ocean systems. Areas covered by the journal include; * Undersea technologies: AUVs, submersible robot, manned/unmanned submersibles, remotely operated underwater vehicle, sensors, instrumentation, measurement, and ocean observing systems; * Ocean systems technologies: ocean structures and structural systems, design and production, ocean process and plant, fatigue, fracture, reliability and risk analysis, dynamics of ocean structure system, probabilistic dynamics analysis, fluid-structure interaction, ship motion and mooring system, and port engineering; * Ocean hydrodynamics and ocean renewable energy, wave mechanics, buoyancy and stability, sloshing, slamming, and seakeeping; * Multi-physics based engineering analysis, design and testing: underwater explosions and their effects on ocean vehicle systems, equipments, and surface ships, survivability and vulnerability, shock, impact and vibration; * Modeling and simulations; * Underwater acoustics technologies. Dept. of Naval Arch. and Ocean Eng. Dept. of Civil Hydraulic Eng. Dept. of Ocean and Mechanical Eng. Dept. of System & Naval Mechtro. Eng. Dept. of Mech. and Astronautical Eng. Univ. of Naples "Federico II"
Dept. of Naval Arch. and Marine Eng. Dept. of Ocean Tech., Policy, and Env. Korea Ocean Research & Dev. Inst. Dept. of Naval Arch. & Ocean Eng. Port, Coastal and Offshore Eng. Center for Marine Tech & Eng. Dept. of Civil & Environmental Eng. Norwegian Univ. of Sci. and Tech. Environment & Urban Develop. Div. Dept. of Mech. Struct. Eng. Mater. Sci. Dunarea de Jos Galati Univ. School of Naval Arch. & Marine Eng. Offshore wind turbines are complex structural and mechanical systems located in a highly demanding environment. This paper proposes a multi-level system approach for studying the structural behavior of the support structure of an offshore wind turbine. In accordance with this approach, a proper numerical modeling requires the adoption of a suitable technique in order to organize the qualitative and quantitative assessment in various sub-problems, which can be solved by means of sub-models at different levels of detail, both for the structural behavior and for the simulation of loads. Consequently, in a first place, the effects on the structural response induced by the uncertainty of the parameters used to describe the environmental actions and the finite element model of the structure are inquired. After that, a mesolevel FEM model of the blade is adopted in order to obtain the detailed load stress on the blade/hub connection. This study investigated the behavior of a non-isothermal CO2 bubble formed through a leak process from a high-pressure source in a deep sea. Isenthalpic interpretation was employed to predict the state of the bubble just after the leak. Three modes of mass loss from the rising bubble were demonstrated: dissolution induced by mass transfer, condensation by heat transfer and phase separation by pressure decrease. A graphical interpretation of the last mode was provided in the pressure-enthalpy diagram. A threshold pressure (17.12 bar) was identified below which the last mode was no longer present. The second mode was as effective as the first for a bubble formed in deep water, leading to faster mass loss. To the contrary, only the first mode was active for a bubble formed in a shallow region. The third mode was insignificant for all cases. This study revealed the behavior of droplets formed through leak process in deep water. There was a threshold depth named the universal attraction depth (UAD). Droplets rose upward in the zone below the UAD called the rising zone, and settled down in the zone above the UAD called the settling zone. Three mass loss modes were identified and formulated: dissolution induced by mass transfer, condensation by heat transfer and phase separation by pressure decrease. The first two were active for the settling zone, and all the three were effective for the rising zone. In consequence, the life time of the droplets in the rising zone was far shorter than that of the droplets in the settling zone. In this paper, an offshore process front end engineering design (FEED) method is systematically introduced and reviewed to enable efficient offshore oil and gas production plant engineering. An integrated process engineering environment is also presented for the topside systems of a liquefied natural gas floating production, storage, and offloading (LNG FPSO) unit, based on the concepts and procedures for the process FEED of general offshore production plants. Various activities of the general process FEED scheme are first summarized, and then the offshore process FEED method, which is applicable to all types of offshore oil and gas production plants, is presented. The integrated process engineering environment is presented according to the aforementioned FEED method. Finally, the offshore process FEED method is applied to the topside systems of an LNG FPSO in order to verify the validity and applicability of the FEED method. Presented herein is a study on reducing the hydroelastic response of very large floating structures (VLFS) by altering their plan shapes. Two different categories of VLFS geometries are considered. The first category comprises longish VLFSs with different fore/aft end shapes but keeping their aspect ratios constant. The second category comprises various polygonal VLFS plan shapes that are confined within a square boundary or a circle. For the hydroelastic analysis, the water is modeled as an ideal fluid and its motion is assumed to be irrotational so that a velocity potential exists. The VLFS is modeled as a plate by adopting the Mindlin plate theory. The VLFS is assumed to be placed in a channel or river so that only the head sea condition is considered. The results show that the hydroleastic response of the VLFS could be significantly reduced by altering its plan shape.